Helping pets live longer, healthier lives. 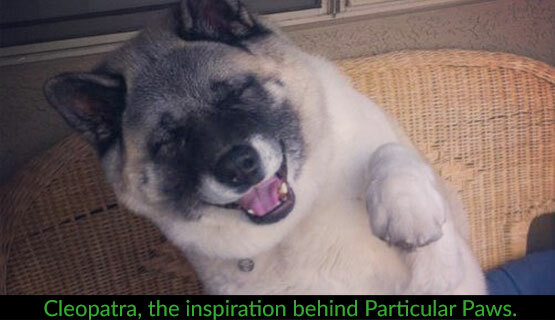 I had to say goodbye to my best friend, a beautiful 120 lb Akita named Cleopatra, when she was only 13 years young. She had been suffering from arthritis, and her condition which at first was just debilitating, had become crippling. I was heart-broken when I returned from a business trip and my good buddy who had been taking care of her, gently let me know he thought her quality of life was suffering and it may be time to say goodbye. I was not ready to hear this. I hoped Cleo would quietly pass away in her sleep when it was her time. Unfortunately, that was not the case and I had to make the toughest decision of my life. After she was gone, I felt empty without her and I thought I'd never be able to love another dog like that again. 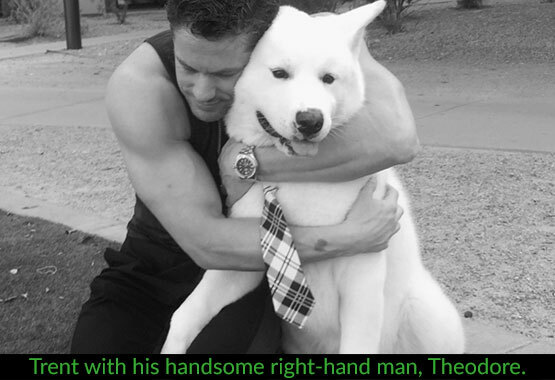 But that changed last year when I stumbled upon Theodore, a handsome all-white Akita with a pink and black nose who was the only one left of his litter seeking a forever family. While I still miss Cleo every day, Theodore has been my new best friend and is also my right-hand-man. Cleopatra inspired me to create my first Particular Paws product, the advanced formula joint + hip supplement and Theodore inspires me as I develop new, natural, holistic products and supplements to help upgrade cats’ and dogs’ quality of life and well-being. I believe Cleopatra passed away too young and our dogs should live 15 plus years or More! We need to take care of our pets the way we take care of ourselves. While I was raising Cleo, I was not educated on the benefits of an all-natural diet and healthy supplements for ailments like arthritis, anxiety, allergies and digestive issues. Since her passing I started researching pet health and discovered dogs and cats are more likely than humans to die of cancer. That’s just unacceptable. 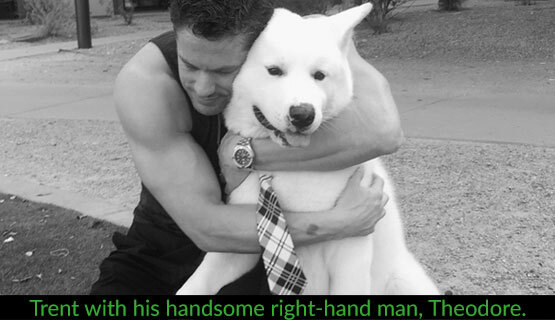 So I made it my mission to create products that would help pets live longer and with a better quality of life. 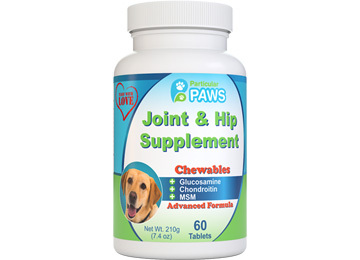 The first product I created was the Particular Paws Advanced Formula Joint and Hip Supplement. This chewable, drug-free, natural formula contains Glucosamine, MSM, Chondroitin, Hyaluronic Acid, Omega 3 & Omega 6 has a taste and smell dogs love! But most important, it helps ease the pain from arthritis and joint issues and is safe to give to young dogs as a preventative measure. Since then, I have gone on to create 24 more products that are sold on ParticularPaws.com, Amazon.com and Chewy.com. This year I fulfilled a dream and created 2,400 “Dog Rescue Kits” full of our 10 best-selling products - and donated them to Rescue Groups across the country. I like to envision Cleo’s tail wagging when I read all the 5 star reviews and customer testimonial videos and photos we receive. I wish I had created my line when Cleo was just a puppy so she could have lived a much longer, and healthier life. You don't have to go through what I did. Start your dog on Particular Paws products today and give your dog the quality of life they deserve! Helping pets, live longer healthier lives. Particular Paws is a small, family-owned pet supplement and product company dedicated to helping all pets live longer, healthier lives. 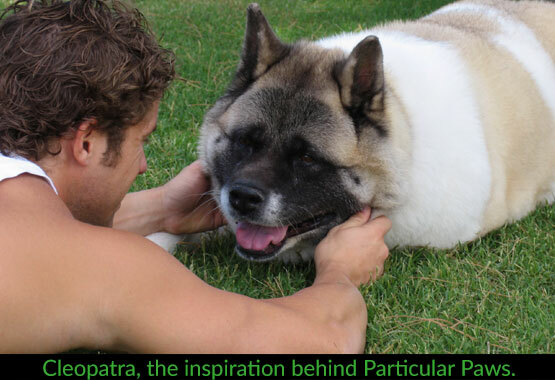 I had to say goodbye to my best friend, a beautiful 120 lb Akita named Cleopatra, when she was only 11 years young. She had been suffering from arthritis, and her condition which at first was just debilitating, had become crippling. I wish I had created my line when Cleo was just a puppy so she could have lived a much longer, and healthier life. But you don't have to go through what I did. Start your dog on Particular Paws products today and give your dog the quality of life they deserve! New Videos, Discounts and More!